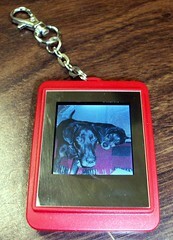 I received a Digital Photo Frame Keychain in red for review. This 1.5" x 2" digital frame keychain is perfect for taking some of your favorite snapshots on the go. Clip it to your handbag or knitting tote and you'll always have a "brag book" handy to show family and friends. 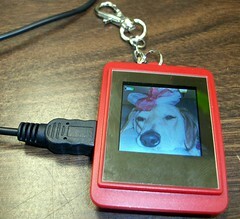 The Digital Photo Frame Keychain has 32 MB of internal memory, which can hold up to 475 pictures. The LCD display is 1" x 1" - your photos will automatically be cut to this size by the software or you can choose to manually crop your photos for optimal viewing. Photos can be viewed manually or with the auto slide show. There is also a date and time display and the keychain allows you to manually switch between a photo or time display. The Digital Photo Frame Keychain features a built-in 3.7V lithium battery which is charged through the USB cable that comes with the keychain. It is not clear how long a typical battery charge will last. The keychain can be personalized with your name on the back, which is a fun feature. Overall, it is a nice way to keep some favorite photos close by, however I wouldn't attach this to your actual keychain. I don't think the plastic would hold up to the beating and banging that I know my own keys take. The Digital Photo Frame Keychain would make a fun gift for family and friends, especially as a non-traditional means of sharing photos for a Birth Announcement, Graduation, Wedding, etc. You're right, nice idea for a gift. Load on some pictures and give it to friend or family. You always find the neatest things! This would make a perfect gift for my parents with pics of the kids on it!